To support solar technology demonstrations during the 2011 convention. VMZinc standing seam Quartz Zinc roofing. September 29, 2011 (Raleigh, NC) — Umicore Building Products (UBP), headquartered in Raleigh NC, will provide the standing seam architectural zinc — one-inch VMZ Double Lock Standing Seam in QUARTZ-ZINC — for the Solar Bay Pavilion’s full-scale solar roof mock-up at the 2011 MetalCon International convention and exhibition, booth #1247. The convention will be held October 11-13 in the Georgia World Congress Center in Atlanta, Georgia. The Solar Bay Pavilion is MetalCon’s central space where visitors discover the newest solar products and solar integration technologies for metal roofing and wall systems. Solar panels will be attached to UBP’s VMZINC® roof. 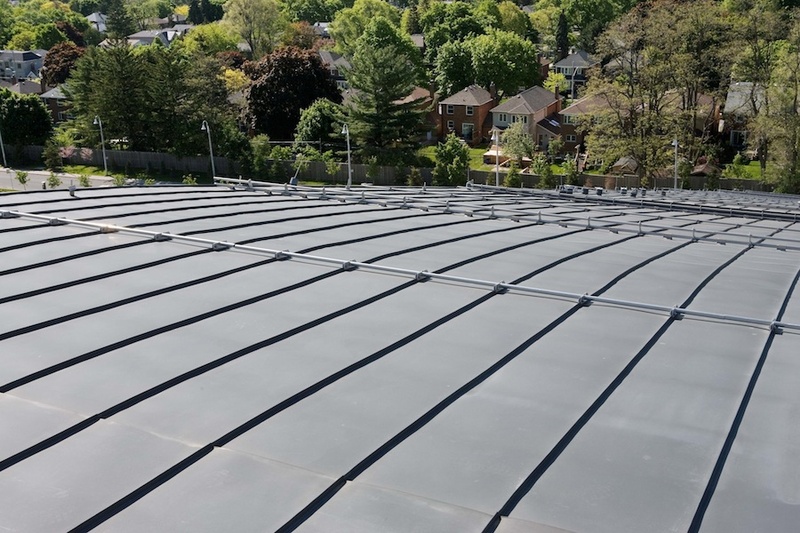 The Solar Bay Pavilion allows experts and product engineers from both industries to demonstrate the best methodologies for integrating solar technology into metal roofing and construction projects. Experts will also be on hand to offer tips, tools, and trade secrets on metal and solar technology. Among the speakers scheduled to appear in the Solar Bay Pavilion are Bill Poleatewich of Dawn Solar, who will discuss “High Performance Building Envelopes: The Convergence of Metal, Renewable Energy and Energy Efficient Construction” on Wednesday at 1:30 p.m.; and Vince Barleto of Inovateus, who will present “Steps for a Successful Solar Project Installation on Metal Roofs” at 3 p.m.
Construction of the VMZINC Solar Bay Roof will take place on Sunday, October 9. Set up for Solar Bay exhibits and installation of the Solar Bay equipment will take place on Monday, October 10th. MetalCon International is the only annual conference and exhibition dedicated to metal construction products, technologies and solutions. Organizers expect attendance to exceed 8000. For more information: www.metalcon.com. For more information on Umicore Building Products USA and VMZinc, visit www.vmzinc-us.com. Umicore is a world-leading producer of architectural zinc. For over 160 years Umicore has been providing innovative solutions for building owners, architects and contractors. Umicore has offices and representatives all over the world. In the United States, Umicore Building Products USA, Inc., is based in Raleigh, NC. For additional information, visit www.vmzinc-us.com.